Choosing the right carrier for your shipment is no easy decision. At Blue Lightning Logistics, we understand that your company’s transportation needs are about more than just getting product from “point A” to “point B” — and we know what’s at stake when things go wrong. Our expertise in cold chain logistics for industries requiring more complex methods of controlled monitoring during transit is just one of the many ways Blue Lightning Logistics keeps pace with its customers and has kept them coming back for over a decade. Blue Lightning Logistics has a proprietary fleet of tractors and trailers designed for any shipping needs. Our experienced drivers work exclusively for the organization and are committed to delivering your shipment with a personal touch, on time and on budget. Bringing over 10 years of experience in logistics, we consider ourselves an important extension of your organization and value chain. Our customers range from the Fortune 100 to small and medium-sized businesses. 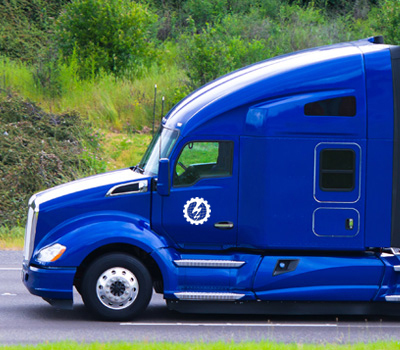 Blue Lightning is an asset-based trucking company, managing our own fleet of trucks, trailers, and drivers. Our goal is to create a long-term, personable relationship with our customers and scale to your needs. We offer customized solutions designed to accommodate your constant and multi-temperature needs. Our trucks are equipped with live temperature tracking and GPS systems so you always know where your shipment is located! “I can’t say enough good things about Blue Lightning! These guys are great. They provide us with excellent service, on time deliveries and good communication. They are very professional and will run just about anywhere. You are making a good choice to use these guys.